A graduate of University of Ulster, Caóilfíonn Murphy O’Hanlon’s original training was in Photography which led her to capture the landscape around her and created an addiction to light, form and colour. Subsequent study of Millinery, under numerous international tutors, encouraged an exploration of evolving textiles and new materials, merging traditional skills with modernity. Her textile work is a quirky organic fusion of natural fibres, found objects and upcycled fabrics. Caóilfíonn creates wearable art pieces in nuno felt, wall hangings and sculptural felt. More recently she has been working within Community Arts teaching textile workshops. Her textile art has been shipped to Europe, Canada, America and Australia, a visual reminder of a special place…home. 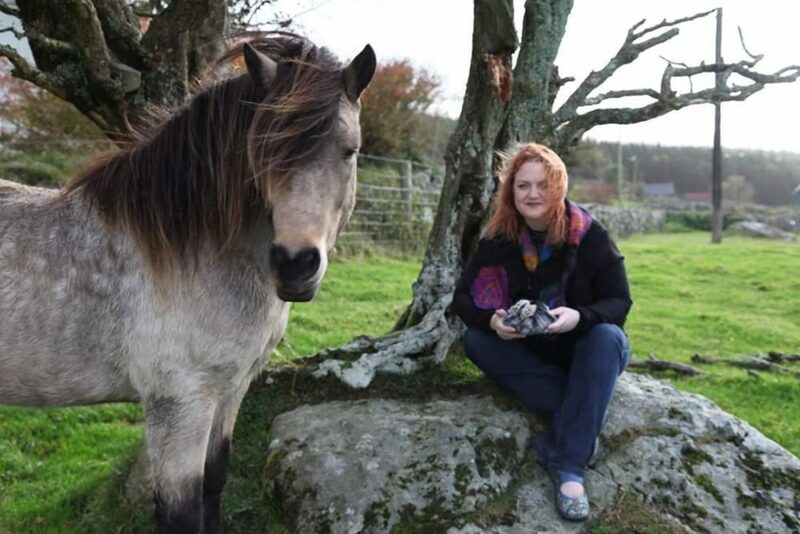 As well as her home studio you can also find Caoilfionn at her studio in Bridge Street Studios, she is also a founding member or the ROGHA arts collective and Feltmakers Ireland. 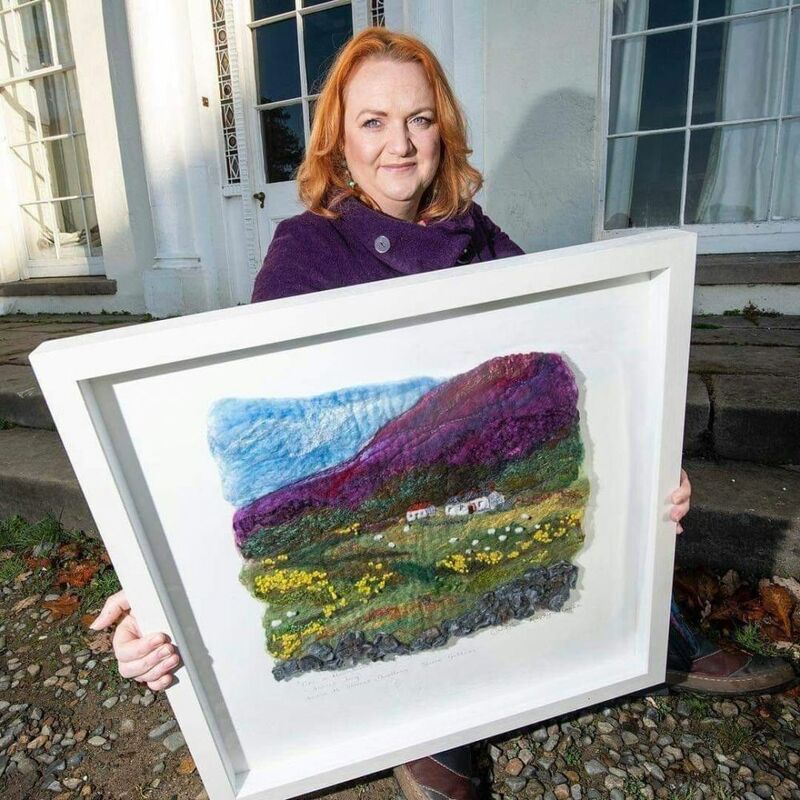 Having been lucky enough to have grown up on a hill farm high on Slieve Gullion I have had a life- long connection with sheep and wool. My earliest memories include skinny, adopted lambs in cardboard boxes warming by the aga in my nana’s kitchen with their tight oily curled fleeces. I remember walking and gathering stray casts of wool from the fields in early summer with my Grandfather. The excitement and noise of shearing and dipping day, when visiting shearers would arrive with their dogs, whistles, craic and slagging and bring all the sheep down from the hills to the paddock for the yearly clip. The sense of smell and touch from these occasions are still so vivid. My nana taught me to knit and to crochet, but discovering the versatility of felting was a revelation to me as artistic expression. I found it soon became my therapeutic, go to textile medium instantly connecting me to the landscape at my door and allowing me to translate the textures, form and sense of place in my work drawing on past bonds and imbuing memories into each piece.